Earlier today, Shaquille O’Neal posted a video on his twitter account stating that he was retiring. He even created his own hashtag, #ShaqRetires which is currently the number two trending topic in the United States. Shaq is one of the most dominant players in NBA history and I must say that it was sad to see him go out the way he did this season. I wish him the best and hopefully more t.v time because his personality is one of a kind. His presence will be missed. Check out a couple of other Shaq videos below. 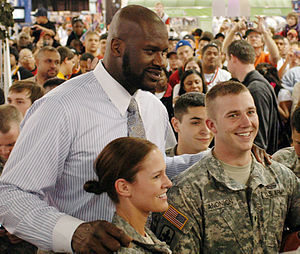 This entry was posted in Sports and tagged nba, Shaquille O'Neal. Bookmark the permalink.